IMO Jean-Pierre makes the best guitars out there. Unsurpassed. A prime example of Jean-Pierre's transitionary work containing all of JP stylistic and construction innovations with a large Jacques body and bevelled headstock. 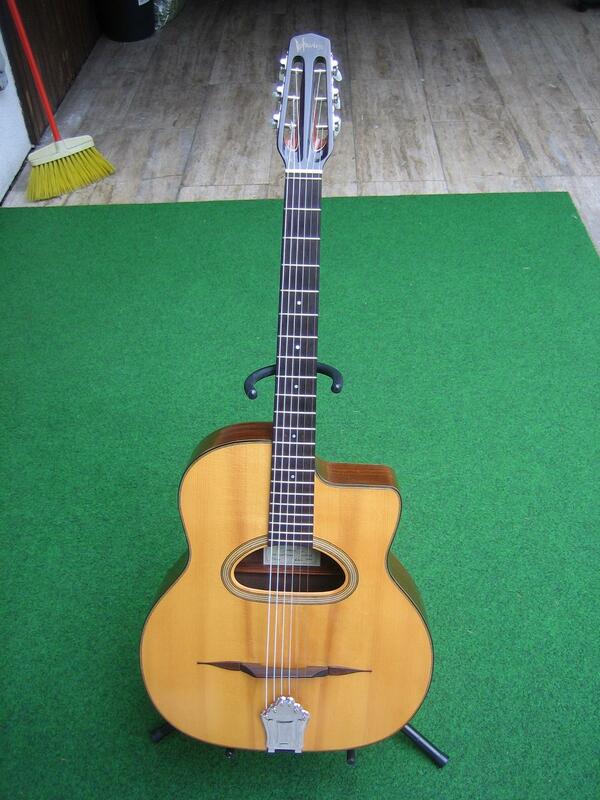 1995, 12 fret d-hole, an amazingly comfortable guitar to play with a dynamite sound. So Jean-Pierre is going to be building Gypsy Jazz guitars again? The pictures on the website look interesting, though I wish he would just make new ones that look like the old ones with the dark finish and such. I'd certainly buy one! So Jean-Pierre is going to be building Gypsy Jazz guitars again? The pictures on the website look interesting, though I wish he would just make new ones that look like the old ones with the dark finish and such. I'd certainly buy one! Jean-Pierre builds his own instruments, not anyone elses. The guitars are, IMO, better than most of the old ones that I've played (and I've played many). His current designs have a depth of tone and character that is much better than anything any current maker is building. A deep, resonant, full bodied mid-range. I have to agree with Ted on this....the guitars that J.P. Favino has been building since the late 80s are IMO the pinnacle of the Selmer design. His guitars have a balance and projection that you just don't hear anywhere else. Some people really like the brash sound of the old Favinos...that's cool too but I think J.P. really improved the design immensely. Any clue about the price of the jazz model? Would I be hearing one on the Pearl Django Book CD? I couldn't find any mention of prices on the site. Anyone know how much they are? Approx. 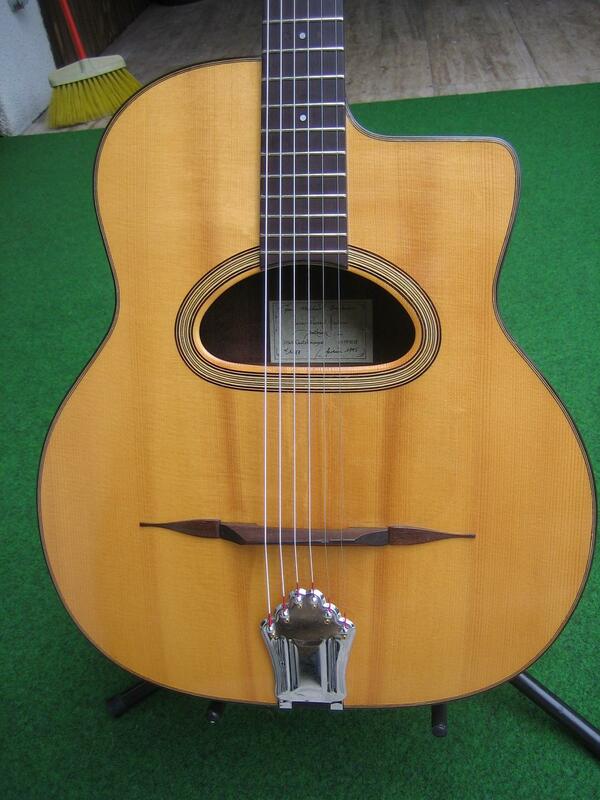 4500€ for the base model (about $5500), things like ebony tailpieces, inlays, etc are more expensive, obviously. Shipping is around $300., and import taxes will add anywhere from $300-$500 to the price so add another $1K to ballpark what you'll be spending. You could always pick the guitar up in person to save that money. As of October '05 he had a 14 month waiting list, which could have gone either up or down since that time. I've placed two order with JP, if you have questions drop them here and I'll answer as best I can. It would be nice if someone could point out a readily accessible video or audio file where we can hear one in action, but Holy Grail mythology aside, in a sane world the Dollar would be worth what it should be in terms of comparative purchasing power, which is all of one Euro. :evil: - is that the pissed off icon?